This Pre-save to Spotify campaign is for Curb artist Lee Brice’s upcoming single “Boy”. We continue to drive a growing number of single pre-save campaigns (versus album or EP campaigns). This is another good demonstration on how quickly and widely pre-save functionality is being using by music labels to promote all types of projects. Our Pre-save Platform supports a broad range of music formats including albums, EP’s, single and even “unknown” releases (See NBT). Once a user connects and pre-saves the single on Spotify, they are encouraged to share the campaign on social media. 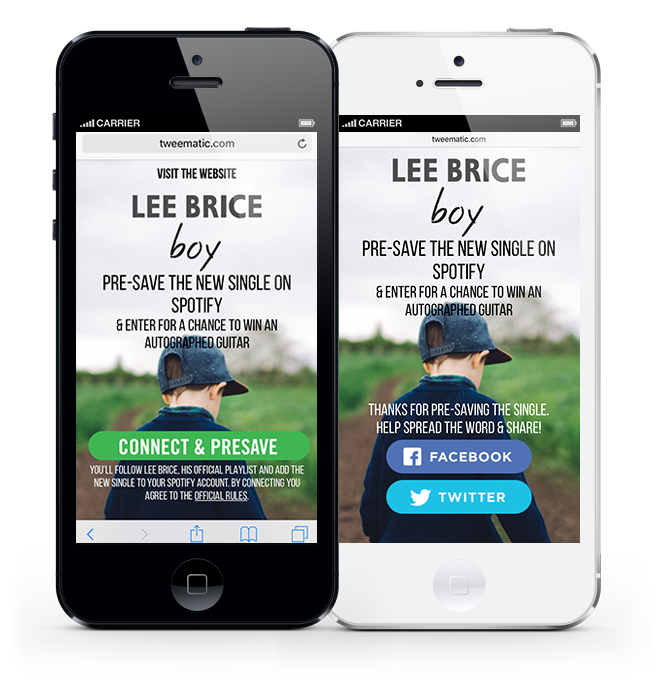 Here is a mobile version of Lee Brice’s Spotify pre-save campaign. Our Pre-save to Spotify platform is fully mobile friendly.